Trust is a topic that comes up regularly with my executive coaching clients. Trust in those around them, feeling as though others trust them, broken trust and wanting to build or restore trust. I learned long ago from Patrick Lencioni’s book “The Five Dysfunctions of a Team” that trust is the foundation to creating highly effective teams. Without a foundation of strong trust, teams don’t engage in healthy conflict and debate, they don’t feel a strong sense of commitment to each other, they’re less accountable and in the end don’t create great results. In working with leaders for many years, I’ve also learned that trust is the foundation for fulfillment as a leader. Without trust, leaders feel disconnected from their teams, isolated and holding the burden of challenging information and decisions, and without the strong relationships necessary to create the future they desire for themselves, the team and the organization. They can’t sleep at night and some even dread going to work. In his book, Lencioni describes trust as a team’s ability to understand and open up to one another. He says that great teams are not afraid to hold back with one another. They are unafraid to air their dirty laundry. They admit their mistakes, weaknesses, and their concerns without fear of reprisal. “Common” Trust: a general confidence your team members won’t break accepted laws, norms, policies, etc. You believe they won’t steal if left in the office alone. It’s the type of trust that we extend to each other when driving. We “trust” people know the rules of the road and will follow them. Without “common” trust, it would be very difficult to operate as a company or society. Belonging to the team typically grants you this type of trust. Vulnerability-Based Trust: a much deeper confidence and belief that you can take risks, ask for help, admit mistakes, or confront and hold others accountable without fear of retaliation, humiliation, shame or resentment. Vulnerability-based trust has to be earned and given. If you want to earn and give vulnerability-based trust, you need to invest in practice trusting first. 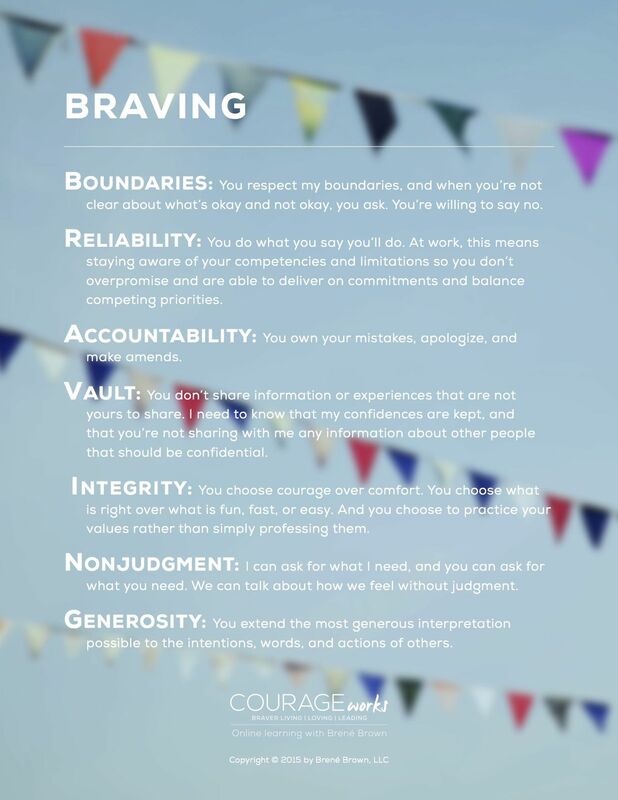 To help you do that, its helpful to understand the elements of vulnerability based trust and Brené Brown, author of Rising Strong, gives us the BRAVING acronym to get really clear. In summary, BRAVING is about having and respecting boundaries, doing what you say you’ll do, owing up to mistakes and making amends, keeping confidences, walking your talk, doing the right thing even when its hard, staying out of judgment and assuming the best intentions of others. When any one of these components of trust is missing, trust erodes. The bar is set higher for you as a leader to build trust. It’s your responsibility as the leader to be the first to give trust and to work hard to earn trust. Trust is built in small moments over time. Once broken, it can be rebuilt and requires commitment to consistent trust building behaviours. It can take as much or more than seven consistent experiences to help the other person feel you can be trusted again. Trust is uncomfortable. It requires you to expose a piece of yourself and risk being hurt. It becomes more comfortable over time when you experience another person taking care of what you’ve exposed to them. The greatest trust comes from struggle. When you work through struggle with someone and stick with them to get to the other side of the struggle. This is the process we see with the development of teams forming, storming, norming and eventually performing. Many teams get stuck in storming by avoiding hard conversations and not working through their differences. As a result, they never become high-performing teams because they never truly trust one another. Creating fulfillment as a leader requires struggle, discomfort, courage and high commitment to building and developing trust.